Modern pocket Otoscope& Ophthalmoscope in a unique, compact design. Handy and powerful based with German XHLVacuum technology. Concentrated bright light for perfect illumination, a brilliant image and accurate colour rendering. We are initiating an elegant new design era. AUG® special optics produce crisp, clear images of the whole area under examination and minimise reflections.Trendsetting XHLVacuum technology completes the AUG®NANOSKOP® line perfectly.This special set contains 1 complete Otoscope, 1 complete Ophthalmoscope in hard plastic case with spare lamps & disposable ear funnels.Available in 3 Colors Black, Royal Blue & Green. 2.5V German Vacuumtechnology gives brighter illumination. Slit or Streak: Helpful in determining various levels of lesions, particularly tumors and edematous disc. Available in cloth pouch without spare lamp. 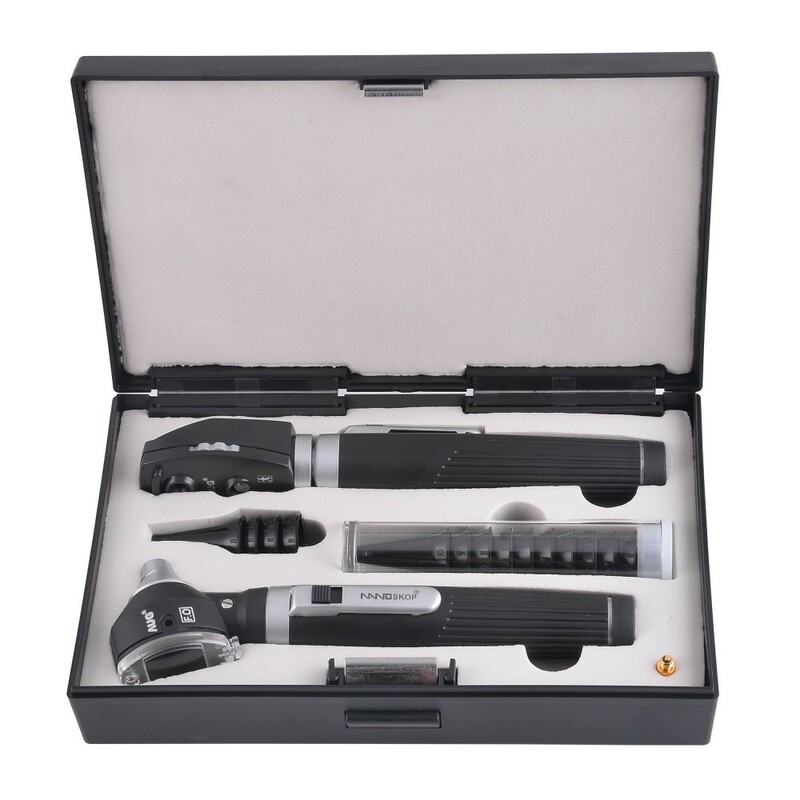 Modern Otoscope & Ophthalmoscope set with LED bulb technology. 1 Otoscope Head 1 Ophthalmoscope ..
Modern Otoscope & Ophthalmoscope set with LED bulb technology. 1 Complete Otoscope, 1 Complete O..
Modern pocket otoscope in a unique, compact design. Handy and powerful. A new focus with the trendy ..
2.5VUNC 8-32COMPATIBLE WITH ALL OTOSCOPES..